According to tradition, Catherine was the beautiful daughter of the pagan King Costus and Queen Sabinella, who governed Alexandria. She had superior intelligence and studied exceedingly well in the arts, science, and philosophy. She decided to remain a virgin all her life, and said she would only marry someone who surpassed her in beauty, intelligence, wealth, and dignity. She had been referring to the eventual discovery of Christ. “His beauty was more radiant than the shining of the sun, His wisdom governed all creation, and His riches were spread throughout all the world”. She was raised a pagan, but became a Christian in her teenage years, having received a vision of the Blessed Virgin Mary and Jesus Christ, in which the blessed Virgin gave St. Catherine to Jesus in a “Mystical Marriage”. As a young adult, she visited the Roman Emperor Maxentius, and attempted to convince him of the moral error in persecuting Christians for not worshipping idols. He arranged for the best pagan philosophers and orators to debate with her, hoping that they would refute her pro-Christian arguments. Catherine won the debate, and succeeded in converting “all” of them to Christianity. The enraged Maxentius executed the philosophers and orators. Catherine was then scourged and put in prison, during which time, over two hundred people came to see her, including the emperors wife. All of them converted to Christianity and were also martyred, including Maxentius’s own wife, the empress. Since he was not able to change Catherine’s mind by torture, he tried to win the beautiful and wise princess over by proposing marriage, and she refused. She said her spouse was Jesus Christ, and she was consecrated to Him. He was so furious that the emperor condemned St. Catherine to death on the spiked breaking wheel, an extreme instrument of torture. During the process the wheel was miraculously destroyed, in answer to St. Catherine’s prayer. Maxentius had to settle for her beheading. According to Christian tradition dating to about 800, angels carried her body to Mount Sinai, where in the 6th century, the Eastern Emperor Justinian had established what is now known as St. Catherine’s Monastery, Mount Sinai. The main Church was built between 548 and 565, and the monastery became a major pilgrimage site for St. Catherine. St. Catherine’s Monastery survives and is a famous repository of early Christian art, architecture, and illuminated manuscripts that remains open to tourists to this day. 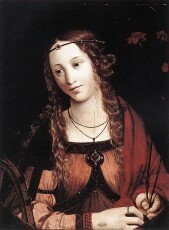 St. Catherine of Alexandria was a very beautiful princess, that was raised as a pagan until the age of thirteen. She converted to Christianity, after a vision from the Blessed Virgin Mary and Jesus. She was an exceptionally learned young lady, and converted everyone she debated, including the Emperor’s wife. They were all put to death, as she converted them, and eventually, St. Catherine was behead for not giving up her faith, at the age of 23. She has become the Patron saint of many things.